I wonder whatever happened to this memorial? It was set up outside the University Avenue office of Sen. Paul Wellstone in Saint Paul on the day he, other family members and campaign staff died in the 2002 crash of an airplane in northern Minnesota. Grassroots tributes — usually in the form of candles, flowers, and written notes — are among the most touching displays of loss. They’re also among the most fleeting. The weather does them in and people move on with their lives and the memorials, if not removed and trashed, fly off into the wind. 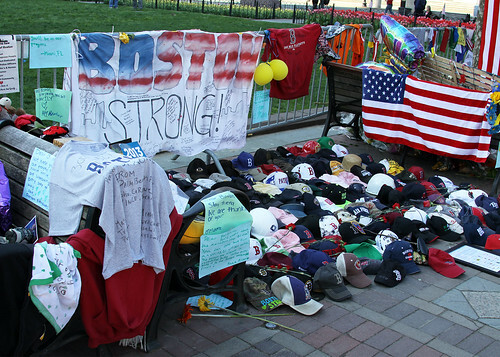 Since last month’s bombing, a memorial has grown on Boylston Street in Boston. Boston isn’t allowing the memorial to go away. With rain coming, archivists are moving it to a building, where it will be catalogued. Rain is heading toward Boston. It will bring out the flowers, turn the grass green, and tell us it’s time to move on. Newer › Why can’t job applicants be treated better?